One line too many a thousand are not enough is a story in which 70% is truth and 30% is fiction. The names have been changed to protect the innocent. The author lived his adolescence in three Latin American countries where he saw many instances where businessmen and politicians were involved in the trafficking of drugs. When he immigrated to the United States he saw their effect on North American Society. It was here that the idea was born to give this understanding to the worlds youth of the great harm in using drugs. 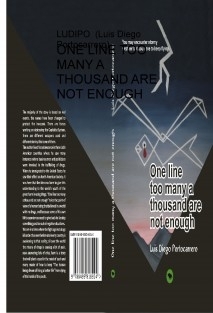 One line to many a thousand are not enough takes the point of view of a human being that believed in a world with no drugs, and because some of his own lifes experiences need to give back to Society something positive out of negative situations. We are in a time where the fight against drugs is harder than ever before and every country is awakening to that reality; all over the world the misery of drugs is causing a lot of pain, now answering lots of cries, here is a story that will plant a seed in the mind of each and every reader of how to keep the Human Dream of living a decent and productive life from dying in the hands of our youth.